How About Something Similar to Ubuntu Control Center in Default Ubuntu? Ubuntu Control Center is a nice simple application to sort things out easily and intuitively in Ubuntu. It is originally inspired from Mandriva Control Center and aims to centralize and organize the main configuration tools available in Ubuntu. 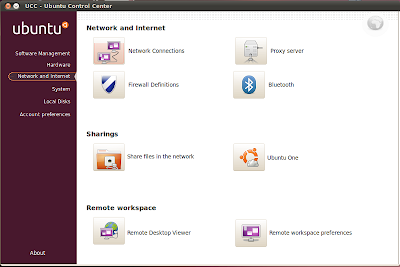 Ubuntu Control Center aims to make life of an Ubuntu user a little more simpler. 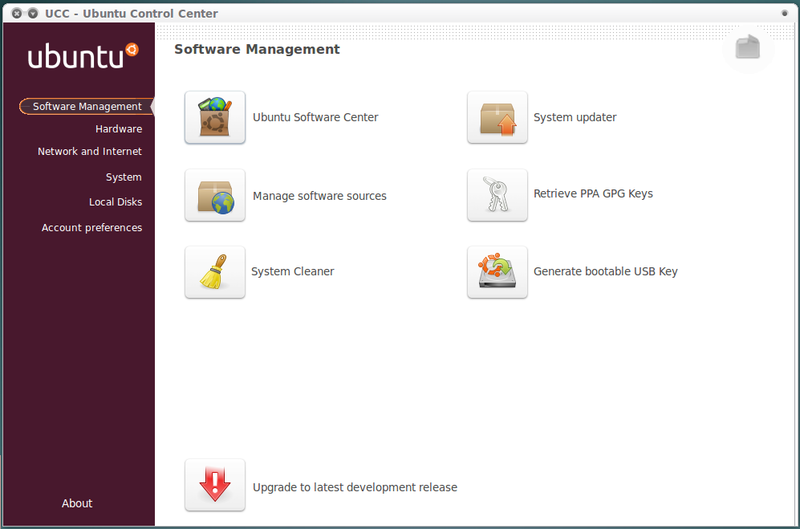 Ubuntu Control Center not only does the organization of different configurations available, but it also installs a number of new third-party apps as well. The new applications include Hardinfo, Boot-up Manager, GuFW, Font-Manager and the new VGA-Switcher using vga-switchero module of kernel 2.6.35. HardInfo is a simple tool that can gather information about your system's hardware and operating system, perform benchmarks, and generate printable reports either in HTML or in plain text formats while Gufw is an easy and intuitive way to manage Ubuntu firewall. With Boot-Up Manager, the user will easily start and stop boot-up scripts, without the necessity to handle through complex links and permissions and Font Manager is a simple font manager for Ubuntu. And finally, StartUp-Manager is used to change settings and manage themes for Grub and Usplash. 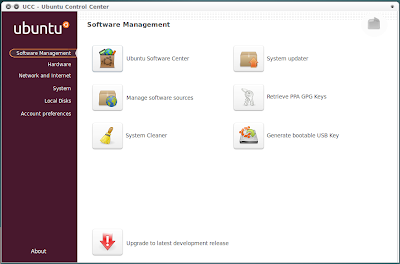 Download latest Ubuntu Control Center DEB Package. After downloading, simply double click the DEB file to install it. Though it still needs a lot of work, Ubuntu Control Center definitely feels a lot more simpler than the default Gnome Control Center you have in your Ubuntu desktop. I would love to see something similar to Ubuntu Control Center in default Ubuntu, obviously a more improved one though in terms of functionality and usability. But this interface is just perfect for me.